Finishing the year with a couple sketches. Found a couple short caves while searching for a stony gorilla. Fire may have recently scoured the land, but the plants return from the roots. Just enough time for some real hiking in the form of an afternoon hike out to the first waterfall in Potrero John. Hopefully. 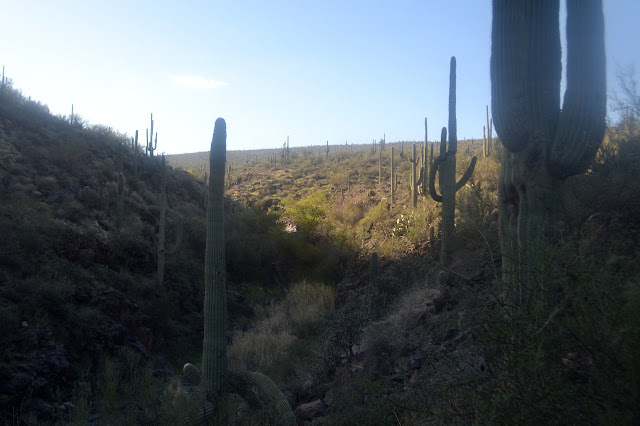 With a couple pauses, we launch ourselves into the narrow canyon that starts off the hike. The crossings are not running very high and there are bits of frozen ground rather than mud still. There is a little mud, too, but there are ways around it. 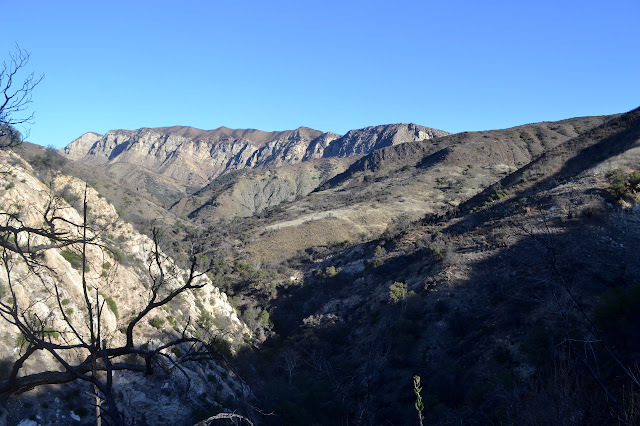 The initial opening into the canyon of Potrero John Creek. 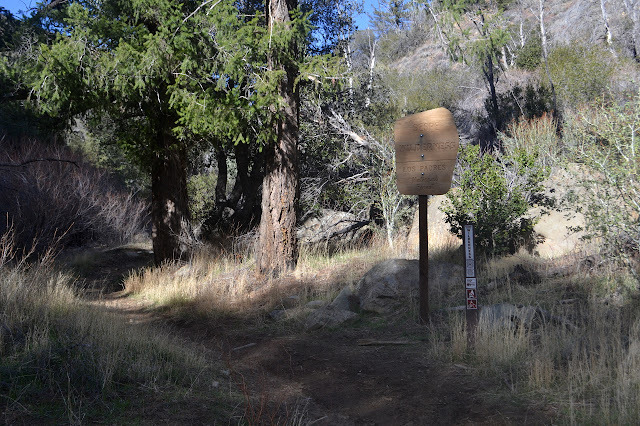 One shinny new wilderness sign to mark the boundary of the Sespe Wilderness. 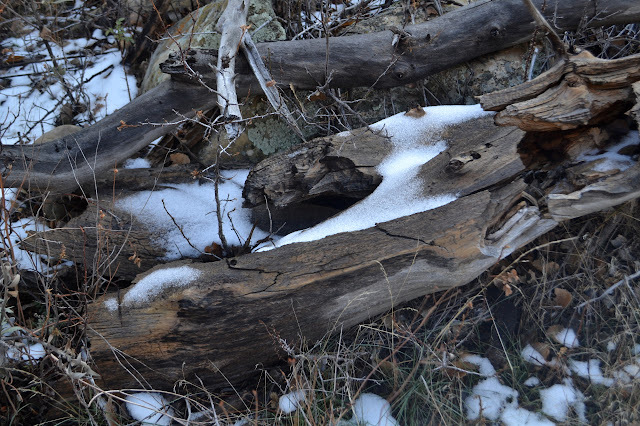 A little bit of icy snow remaining in the more northern portions of the narrow canyon. The canyon opens up again just after we have some difficulty getting over some trail that seems in great need of work with a bunch of trees stretching across it. 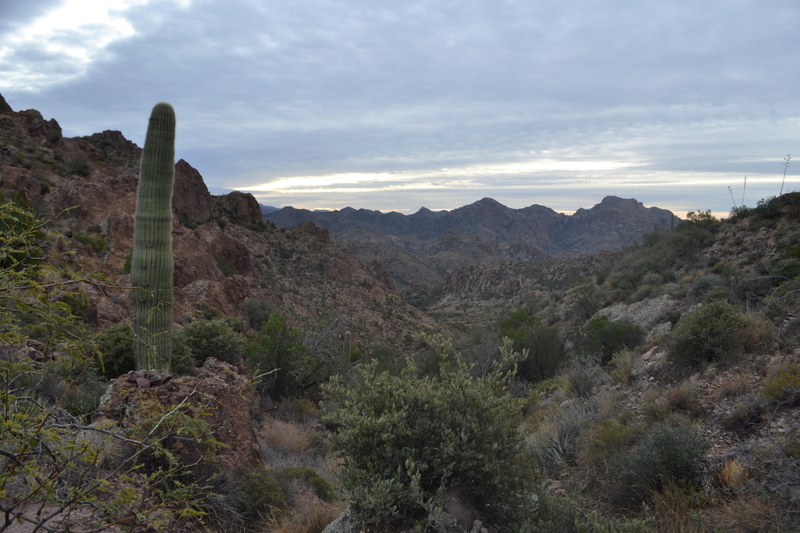 When I did this one cool morning, there was a stark difference in the temperature as the canyon widens. This afternoon, there is no distinct delineation. It is an odd sensation of a missing doorway or something for me. We can climb up it a little faster as the trail has room to find a high, level spot to travel here. A much wider canyon leaves much wider views. There was an invite on to go up CA-33 and find the caches for a piece of "geoart" placed between Potrero John and Chorro Grande Trails. These were all set as "mystery" caches, so the locations are not really at the places required by the art, but mostly along the road. Driving along, stopping, jumping out, and finding a geocache does seem to be the most popular way to do this, but definitely not my favorite. 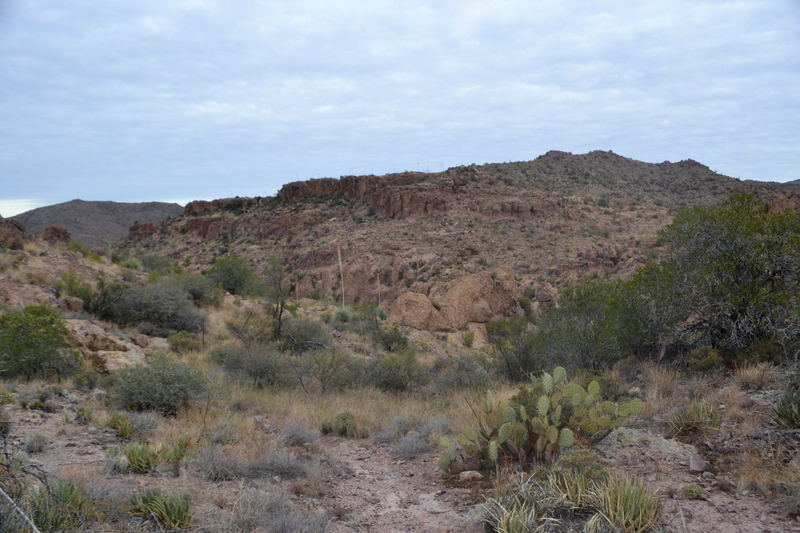 This one also has a few walking excursions and should leave enough time to go on a hike it would be fun to do again. I expected one of the excursions was one I had done before and would be nice to wander up again, too. So I joined up. 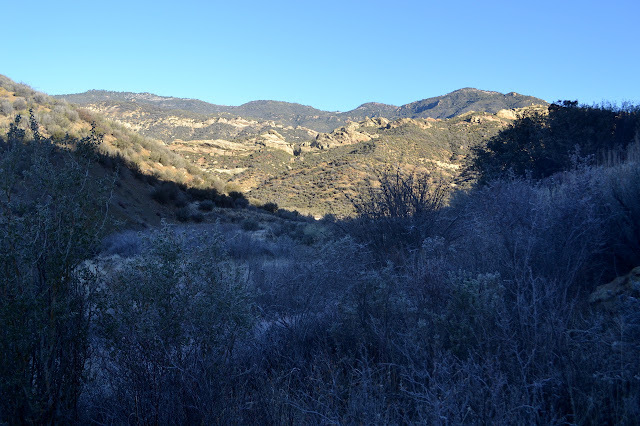 Frosty in the morning shade and snowy in the generally shady as well as high enough up on Reyes Peak. 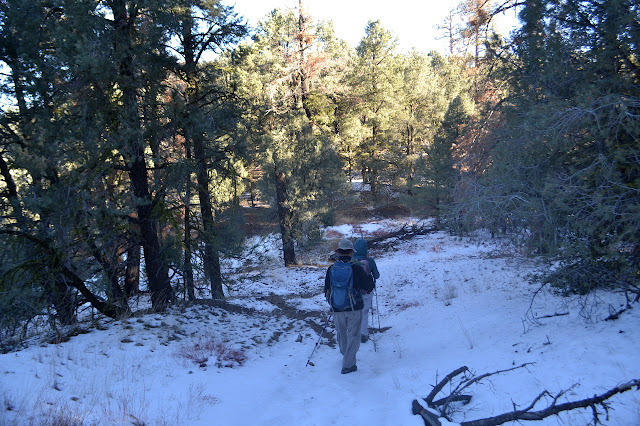 The first excursion we do is the one I was expecting between Burro and Munson Creeks. It is crisp in the shade and frosted over in the night. It snowed a few days ago and a little of that remains in sheltered spots. 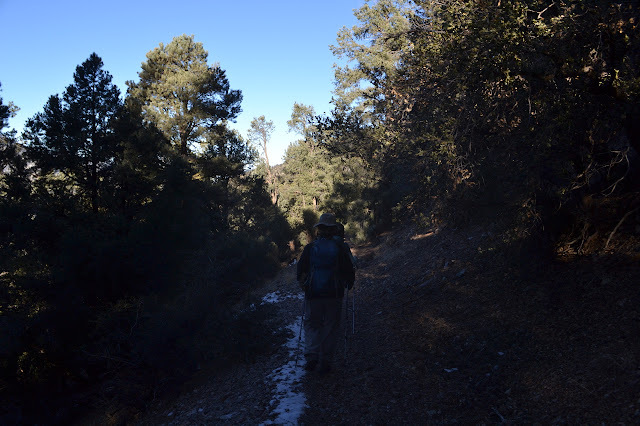 The trail in is nice and easy to walk while it is frozen, but once in the sun and thaw, it becomes a particularly soggy mud that longs to make us slip. 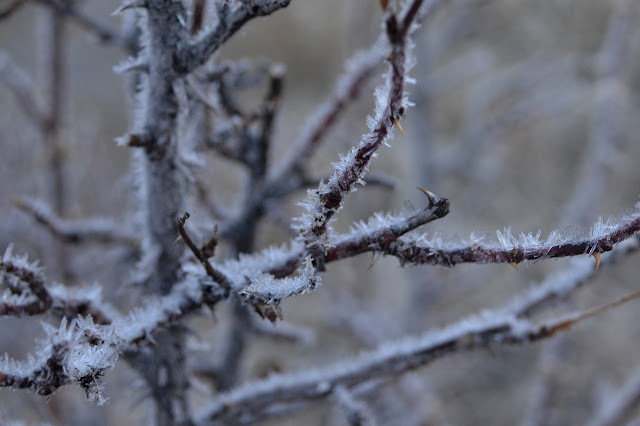 Ice distracts from the thorns of a wild rose. The others stop in the sun to get a little warmth. 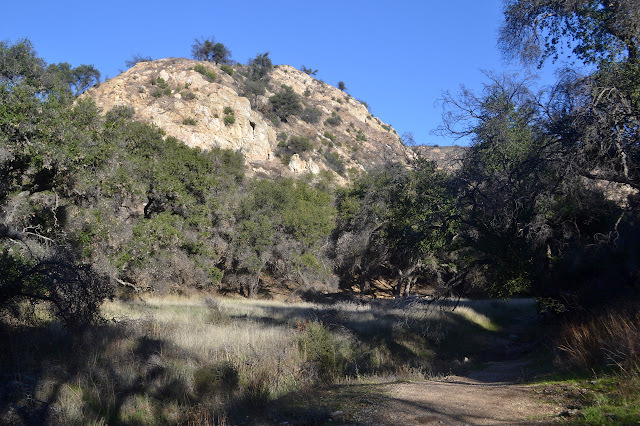 I headed out to the trailhead behind Sage Hill Campground to hike around Aliso Canyon and then around Nineteen Oaks. These two areas were the victims of two recent fires that started very near to the same place. For Aliso Canyon, it was the White Fire in May 2013. For Oso Canyon and Nineteen Oaks, it was the recent Rey Fire. The morning air is quite chill and it is easy to get started and try to warm up. Starting into the canyon in a little sun before it gets particularly shady. A little fall color remaining deep in the shadows of the canyon. 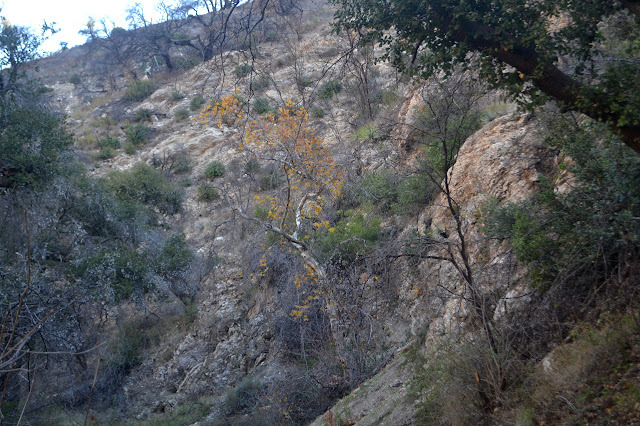 There is a little fall color remaining in that deep and cold canyon. The walk is flat and does not warm quickly. At the junction for the loop, I elect to climb up into the sunshine. Both it and the climb will warm me up. At the top, there are clues of the older burn. The new burn shows in the distance. This time it is for real. 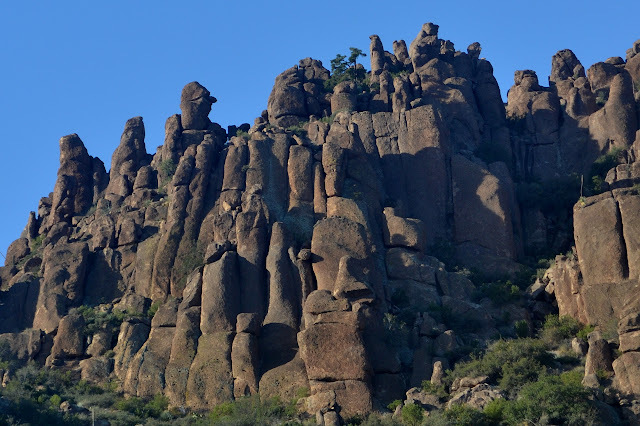 Gorilla Rock is the premier off trail destination from Cold Spring Trail unless the fabled hot spring is real. Since my first attempt to get there got turned around, I asked a few people for help. They turned out to be unhelpful. However, a geocacher saw my note about attempting the trip to a cache out there and he sent along the track from his return trip. That could be very helpful. It still took a very long time to get to trying it again. Getting a late start on a very short day probably will not help. It is already 9:30. I yank on my bike sleeves anyway because going downhill on the north side of the mountain could be a little chilly. Top of Cold Spring Trail on the city side. It looks like a nice day out there. Cold Spring Trail as it continues into the backcountry. It looks like an even nicer day out over the mountains. The sleeves felt nice in the shade at the start, but they are actually a bit much until the trail dips deep into the canyon. 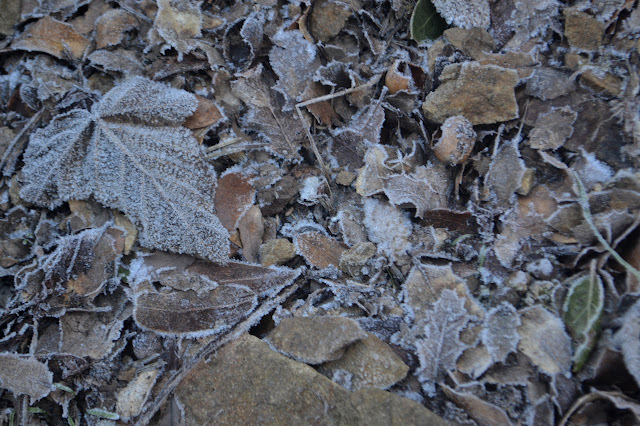 Here, there is frost and some parts of the trail are frozen. It is quite cool as the trail crosses over and stays in the morning shade for a while. It is the last day of fall. Back at Black Rock Campground, we are ready to start what was the main event for me. I have already collected one very reasonable but delisted peak and I was hoping to add a second. Bill, the leader, had been hoping to get it relisted so it is just another peak on the much more than Hundred Peaks list. Bill won and the peak is relisted. There are at least a couple more delisted peaks around for me to collect still. This was delisted for being a "long drive up", but that seems silly when we are about to hike up it entirely on trail from a spot a few minutes from the highway. There is a way to drive up, but there is certainly no requirement to go up that way. Setting off across the campground to find the actual trail. 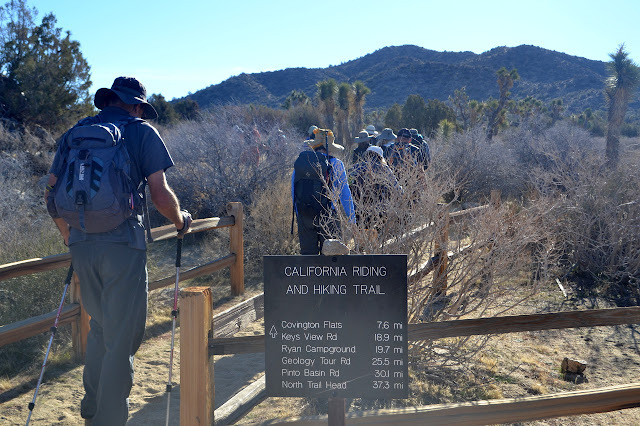 Stepping onto a segment of the California Riding and Hiking Trail, a long trail through California that never quite was. We were left with most of the afternoon to get to camp and set up before the party would start around dark. That is more than enough and there was an offer to pop up Malapai Hill, so I jumped on it. This is a little bump in the middle of a plain the Geology Tour Road goes through and is strikingly different from the other little bumps in the area. It was pointed out to me when I did Bernard and Little Berdoo during a previous Holiday Hooplah and looked like a reasonable and easy thing to climb. We are warned that the footing can be iffy before heading off and told that there is supposed to be a benchmark on the lower peak as we arrive. 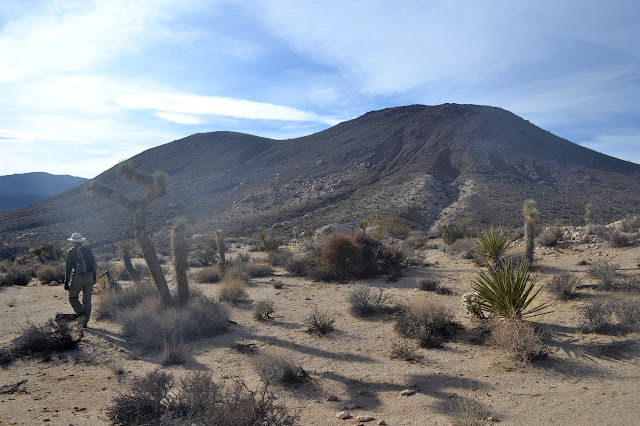 Malapai Hill is a lump of small, dark rocks in the middle of a desert flat where most the lumps are large light rocks. We finished our Arizona trip in time to stop by Joshua Tree National Park for the annual Holiday Hooplah put on by the Hundred Peaks Section. Of course, there are peaks to climb. 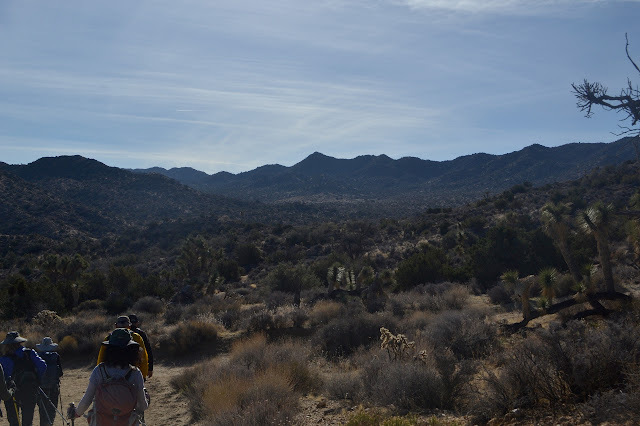 I signed up for some lower peaks, which are on a different list and watched over by a different group, but then had to find another hike due to a leader getting injured. The only one on offer that I had not done was a little hike to Warren Point. This starts from the same location as the hike I signed up for for Sunday and the future will likely have both hikes combined into a single elaborate peak bagging extravaganza. 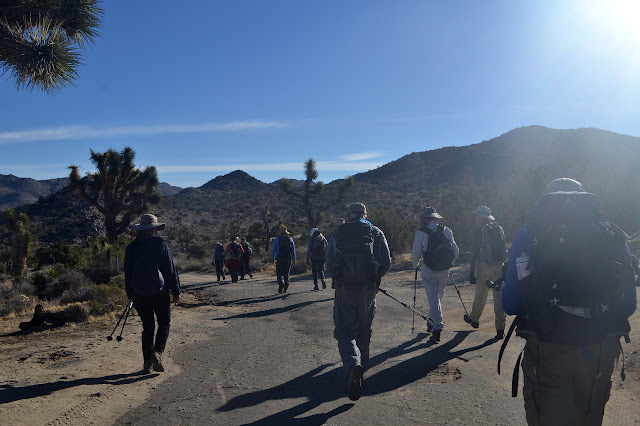 For now, we gather at an easy hour on a mild day to start off into the desert. Starting off into the desert and the sun from the visitor center in Black Rock Campground. 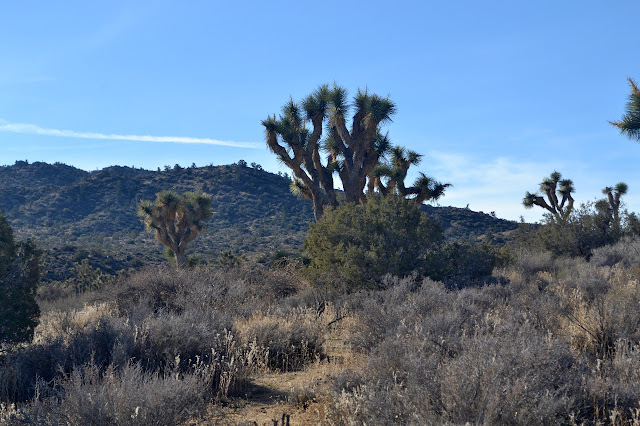 We are in Joshua Tree, so there are the requisite Joshua trees nearby. (Day 5 of 5) We are wet again in the morning, but we will not have to worry about that anymore. It is just a few miles to complete the loop. Phoenix was not so much an eternal sunset without any clouds for the lights to shine on. Fewer things are frosty. Swinging my wet bag through the air can make it frosty and help shake off the water, though. 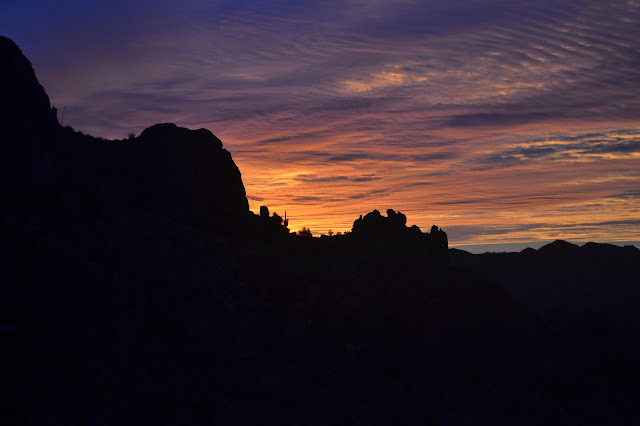 I make breakfast watching the light hit Weavers Needle and the rock pillars all around me. They take on the character of a stadium of people, especially with the sun hitting their "faces". 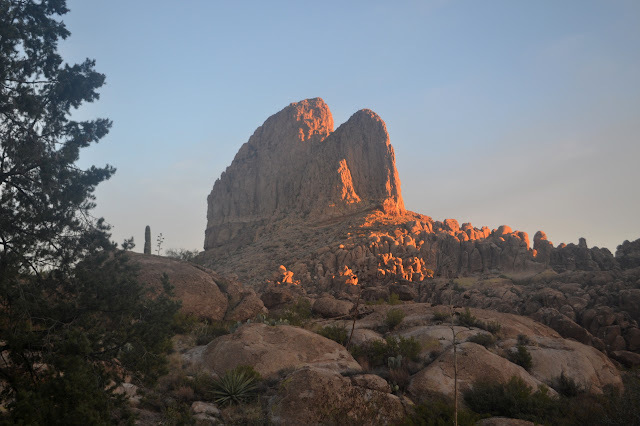 Weavers Needle bathes in the morning sun. Looking up at some of the pillars around the valley. 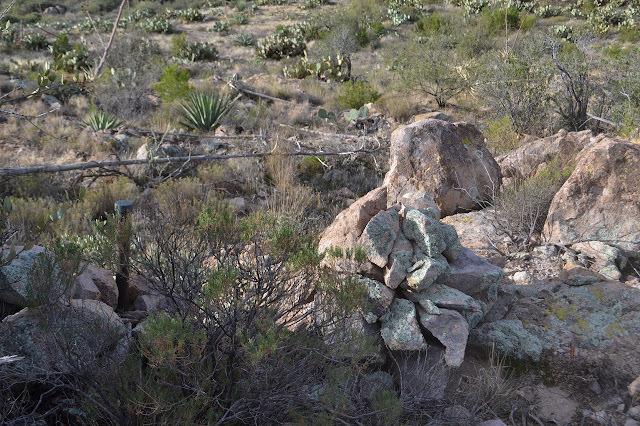 One of the high pinon pines sits atop the nearby rocks. We pack up and head out. Both the Beartooth Publishing and the 1966 USGS maps show a big switchback after the camp, although the first does not actually show the camp, that was going to be my indication that I had gone too far. Now I look for it to confirm I had gotten to the indicated spot. 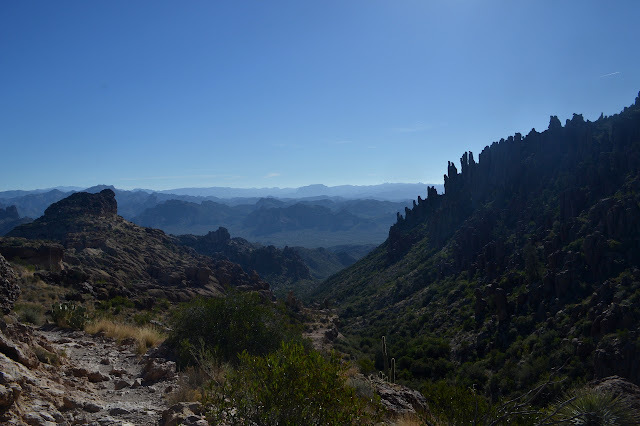 The switchback never comes as we climb to the top of Fremont Saddle. 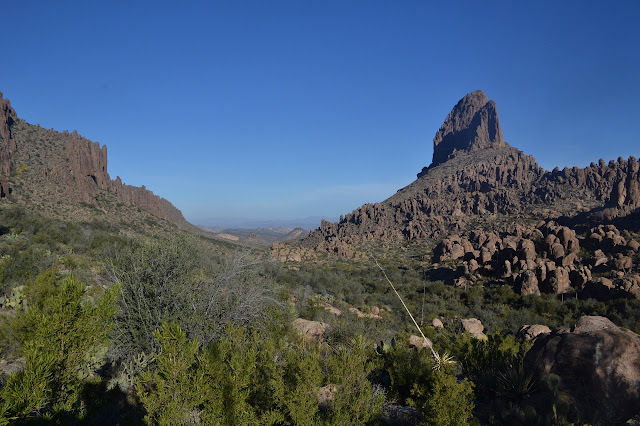 Climbing up the last valley in East Boulder Canyon under the watch of Weavers Needle. 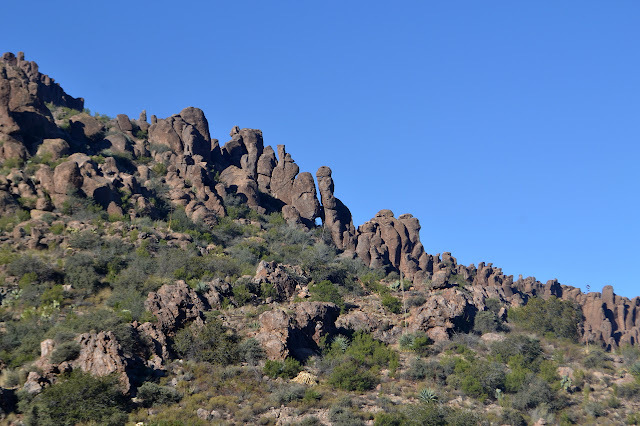 There are lots of strange shapes in the surrounding rocks. 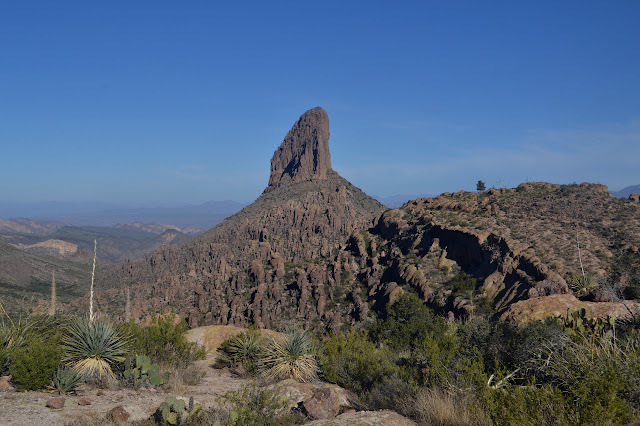 One last look at Weavers Needle. There are more people within a quarter mile of the Fremont Saddle than we have seen over the rest of the trip. This is where nearly everyone in that often crowded parking lot goes to. 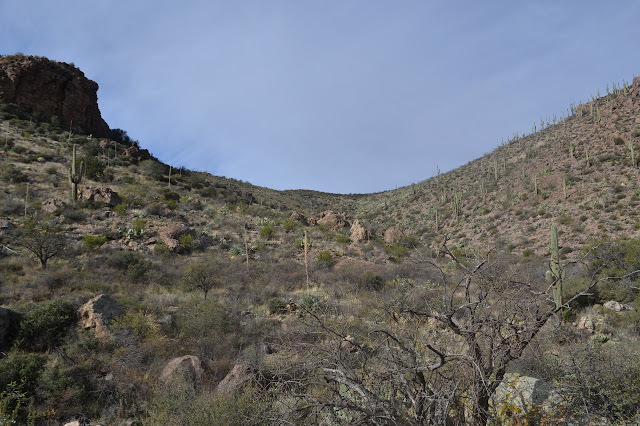 We had thought to come down the more primitive Cave Trail, but after hanging out at the saddle for a while, probably about 100 feet down this unsigned trail, we forget all about that and wander down the main trail. 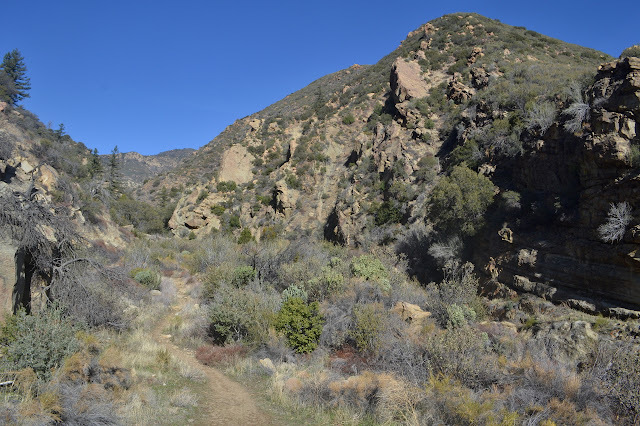 Starting down Peralta Canyon on a well used trail. A rock man looks out at the scenery from atop his rock lion. Water streams from a small spring higher up. 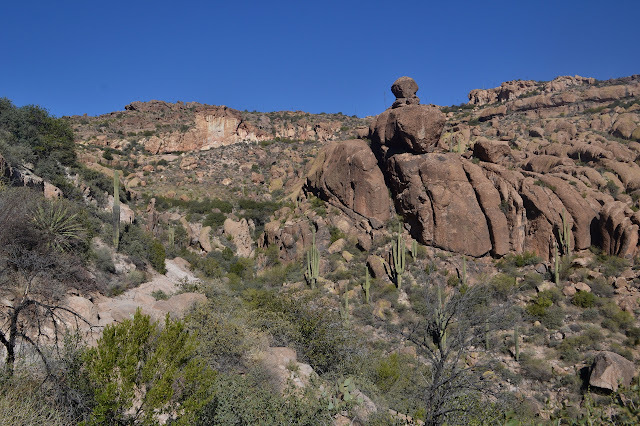 The rocky trail is extremely uneven with the erosion caused by overuse. It reminds me quite a lot of our local city trails. Another balanced rock along the way. Maybe not quite so balanced as the one yesterday. Taking in the changing colors of the rocks around us. The light layer at the top is ash and the dark at the bottom is a basalt of sorts and the yellow in the middle may be contributed by lichens, but is a different rock from the others. 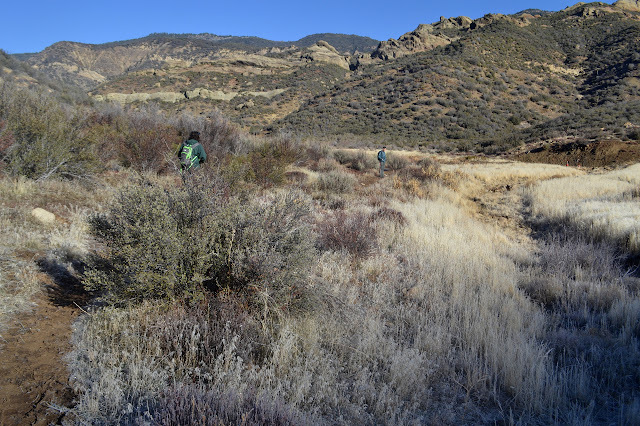 It takes a lot of careful dallying and chatting with people along the trail, but we manage to make these last few miles take up the entire morning before suddenly breaking out of the vegetation into the parking lot. 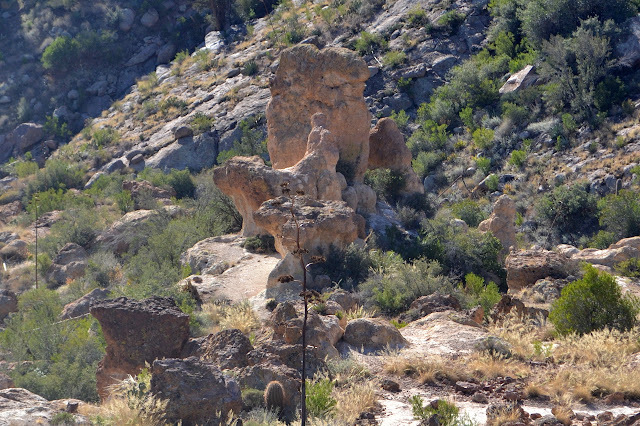 Rock towers around Peralta Canyon. (Day 4 of 5) We wake soggy again, as feared, and spend way too much time waiting for the sun in the deep canyon before I promise we can stop at the top of Black Mesa to dry things out. There should be some quality sun up there, especially if it lives up to its name. We head across the wash to the junction sign, which is resplendent in a bit of ribbon to help people spot it from afar. 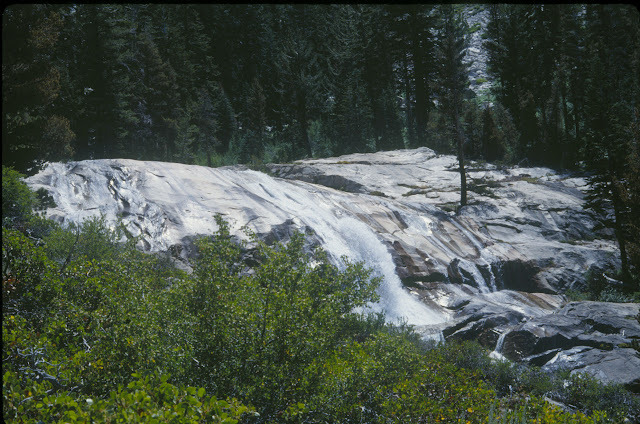 Maybe a quarter mile up the trail, there are pools of water. A thin trail seems to climb up the hill, but does not go much of anywhere. The trail crosses the creek and there is an accessible pool below it, but the water just above the trail looks oily. We look for access above this, but there really is nothing. Somehow the lower pool looks nice enough in spite of the higher pool. And it has a tamarisk. We settle for it and grab water for the day. Second Water Spring, the last of the reliable springs along our route. Also, my camera seems to have gotten some moisture inside. 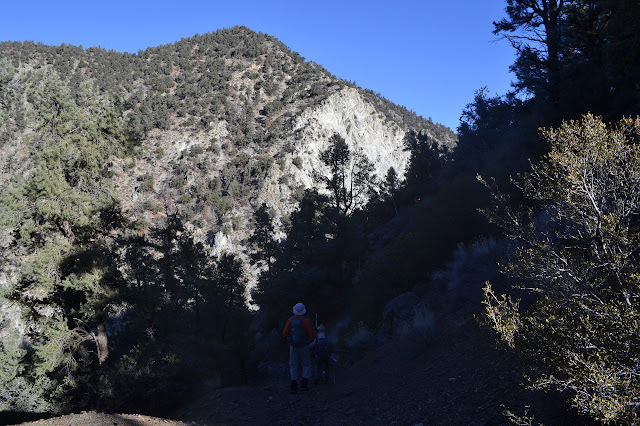 After grabbing water, we continue on our climb away from Boulder Canyon. There are more little pools of water higher up. We are off to see what sort of garden Garden Valley is. We expect it is a cactus garden. There is sunshine ahead. Maybe my camera can dry out, too. Another appearance of Weavers Needle. It will be a lot closer later. Battleship Mountain seems like a funny thing to get a name. We slept below it last night. (Day 3 of 5) Phoenix was an eternal sunset in the southeast even from down in this valley. I was so hungry in the night, I ate half the chia seed pudding that was supposed to be breakfast. 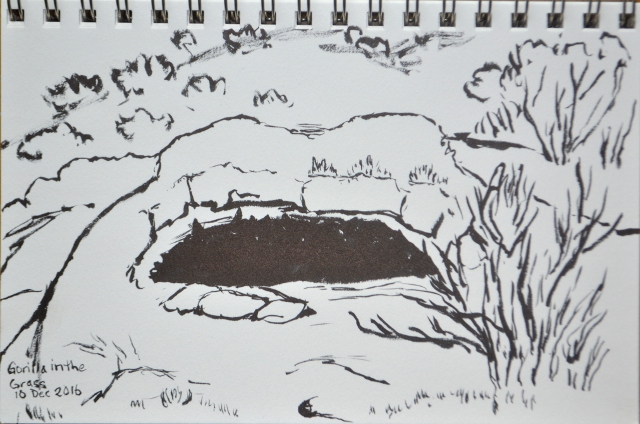 I did this while pondering the frozen drops of water on my food bag and the layer of wet all over my quilt. People keep saying Arizona is a dry heat, but it sure looks like a wet cold from here. It is still just barely freezing as I eat the other half of my breakfast. I am still a little bit hungry. I plot away in the first light, changing the trip a bit. It looks like we might be stuck doing a short day or going out early. 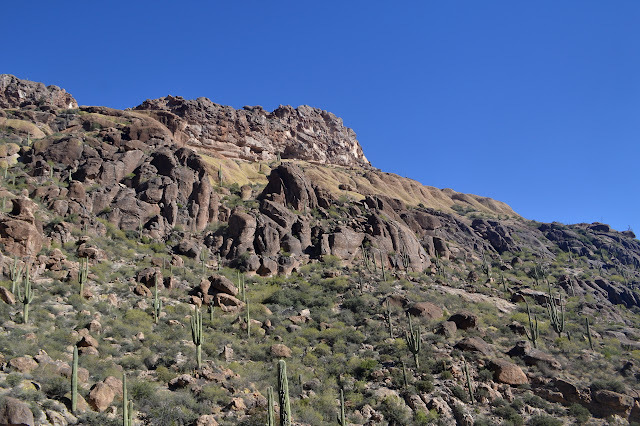 I could still climb Black Mountain off off Peters Mesa like I had originally planned. A wave of dread passes over me at the thought of actually going up the mountain. That is odd. Like I have been traumatized by the cross country escapade yesterday when the unmaintained trail was nothing more than a thought. There is a way that looks like two 8 miles days finishing with 3 miles on the drive out day. 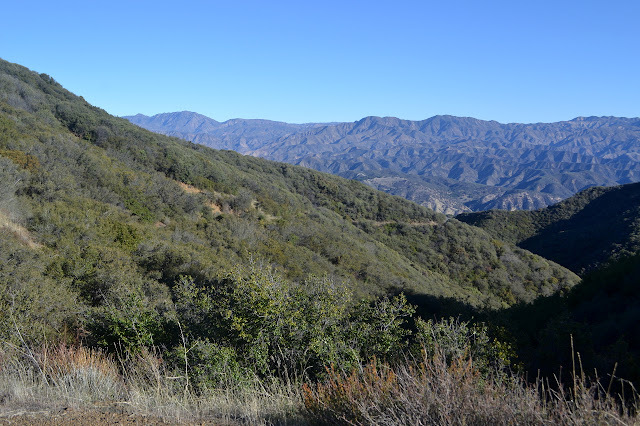 It shortcuts the original route by 2.5 miles and the planned spur to Music Canyon as well as the mountain climbing. There will be no mountain climbing on this backpack. We get a late start on our day while hoping for some sunlight to help dry out our gear and then I sabotage our start time even more after realizing we are just a little way past the second section corner I had wanted to find. It, too, is no longer next to the trail. It is more like 480 feet on the far side of the creek bed. There is a spot to cross a little east that avoids cats claw. Finding this one is a little harder, but then I spot it in a bush. A cairn was helpfully stacked next to it. Well, helpful had I noticed. I make my claim and get back as quickly as is safe. Another section corner post set in 1919 sits beside a witness cairn. 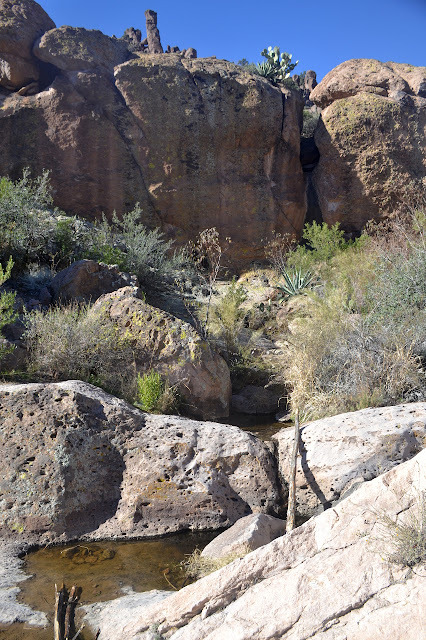 We get going in the correct direction and it is not long before the trail drops to cross the creek by another good sized puddle, then starts climbing up Peters Mesa at a section that has collapsed for a more gentle ascent. 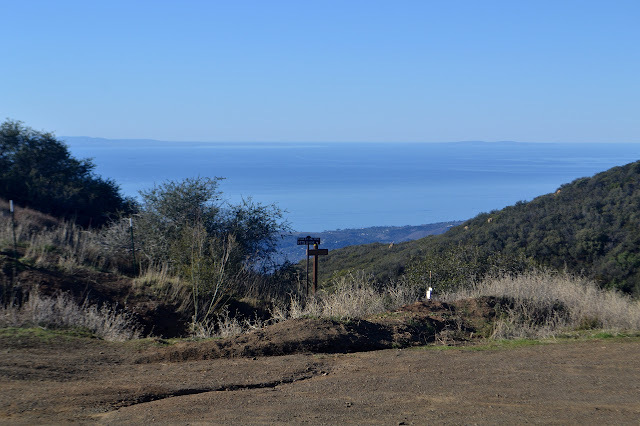 There are grand views at the top. Also plenty of camp sites with fire rings although there is still nothing to burn in the area. A gentle gully provides an easy place to put a trail up Peters Mesa. Tortilla Mountain in all its glory and a little bit of the changing clouds overhead. New mountains on the other side of the mesa. Black Mountain is near on the left and Malapais Mountain is more distant on the right. (Day 2 of 5) The night sure is long this time of year. Orion marches the entire length from east to west as the night goes on. Phoenix is like some sort of eternal sunset on the edge of the sky. Eventually the brightness in the southeast overpowers the brightness in the southwest and it is morning. A sky textured by clouds brightens in the dawn light. As we left, there was a 20% chance of rain for this morning. We expect nothing to come of it, but the cloud cover is nice. It helped keep us a little cooler yesterday and is doing a better job of that today. Not that the day has had much of a chance to warm up anyway. We get ourselves packed and start for the top, which is really just a few turns away. There are more and bigger spaces up there and the air has been very calm. Winds are always a worry at saddles, but last night would have been nice. The divide rolls on to higher things to the east. 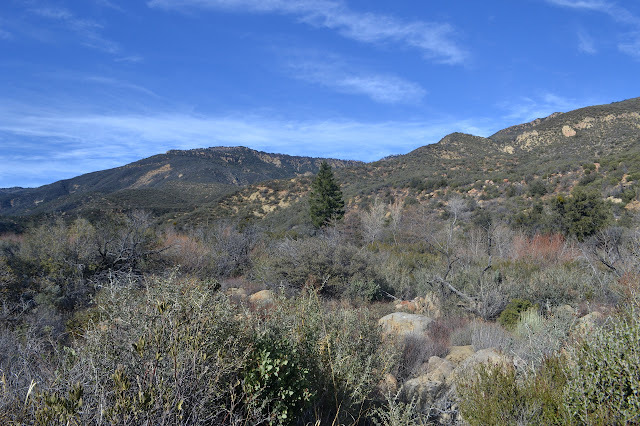 The way to drop down toward Upper La Barge Canyon. One last look back over Red Tanks Canyon. (Day 1 of 5) I had wanted to get about an hour of hiking at the end of the drive yesterday, but it was dark already by the time we pulled into the trailhead. 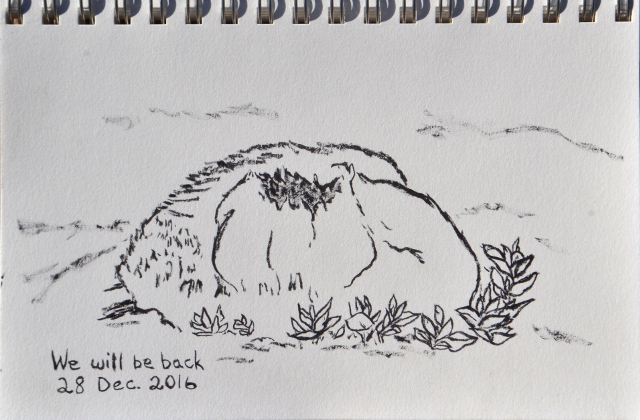 In planning when to leave, I remembered the time change, but all the other little things over the eight hour trip drew it out longer. We could have hiked out in the dark, but that would mean missing this new scenery. Besides, we seemed to have already flipped whatever internal switches there might be to change over from paying attention to the clock to paying attention to the sun. The sun was down and we were tired. We found a place to camp instead of hiking. We will just have to do a little extra hiking when we are fresh on the first day. 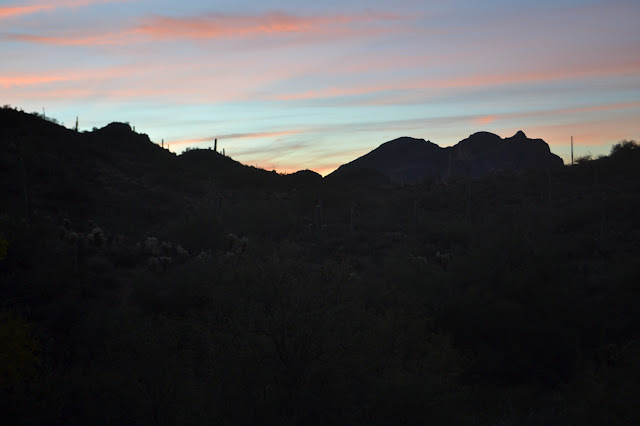 Sunrise at the Peralta Trailhead. 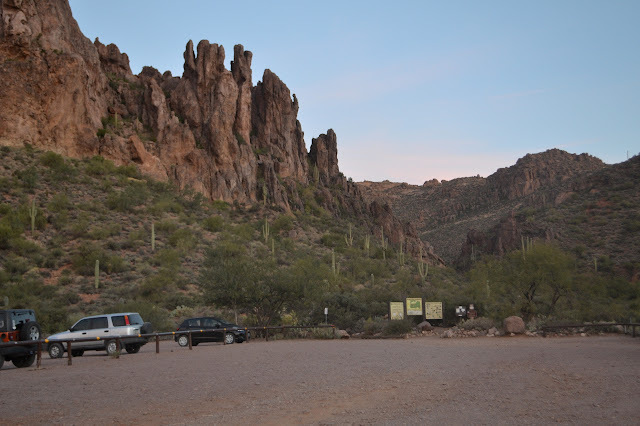 So the break of day finds us at what may be the most popular trailhead outside of Phoenix. Why here? I made a quick search for popular loop hikes and found something that looked good. 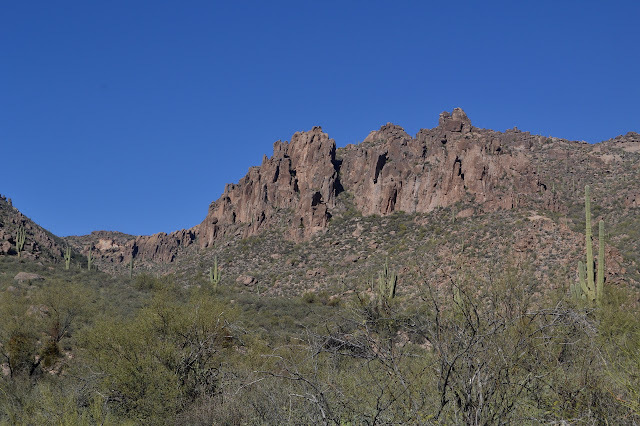 I could find a couple maps of the Superstition Wilderness, so it must be popular. Life is too short to agonize over what would make the best hike. If we found it, where would we go for our second hike? We bought the map from Beartooth Publishing since it actually marks mileages on the trails and the smaller publisher should be more attuned to those places it maps. (I will have some gripes about this map by the end of the trip, though.) 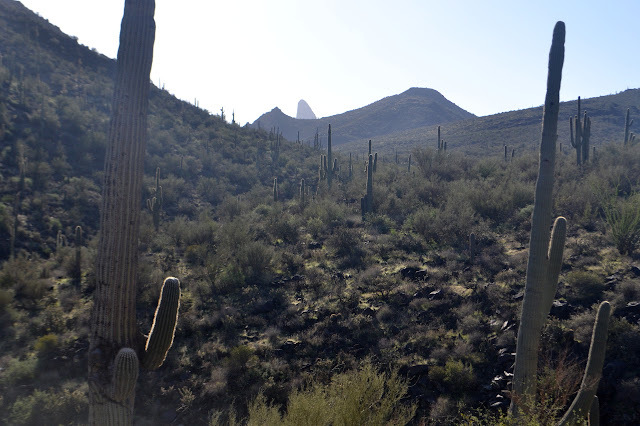 I picked out a couple loops: one on the east side including about 20 miles of the Arizona Trail, and one on the west side wandering high and low over what looks like pretty gentle country. We ultimately chose the lower west side where the plants would be more exotic (and pointy) to us over the higher east with the romanticism of getting in a piece of a long trail. One thing I noticed while looking over the map is that there are no twisty blue lines. Every single creek in the area is intermittent. The route was not solidified until I could find good information on water sources. For our local forest, we have HikeLosPadres to research water conditions. 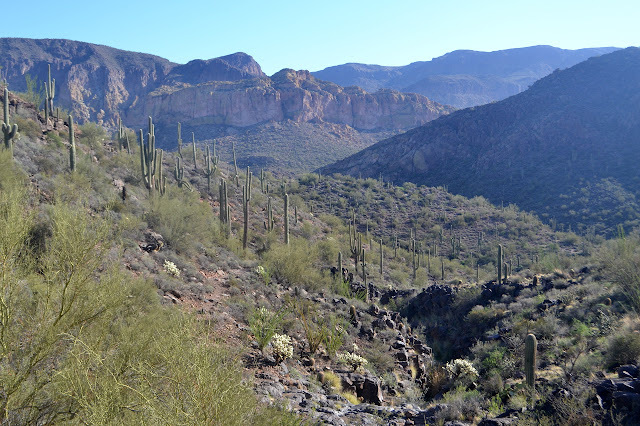 The Arizona Trail has a group devoted to it that reports on water, but they say nothing about away from the trail. 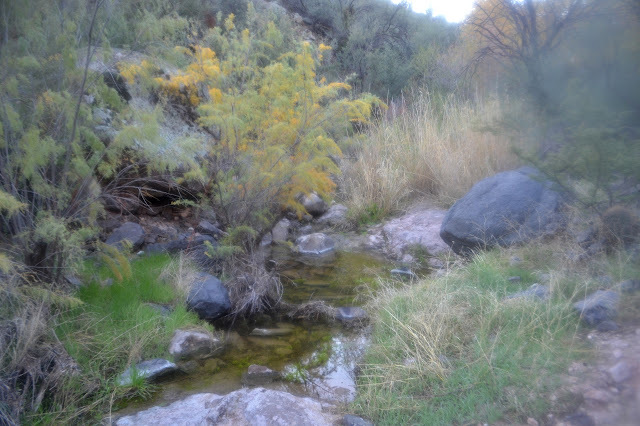 A little more digging and I found that HikeArizona has water reports. This told me that I was passing four well spaced, reliable springs and would have probable water in other places, too. It does not hurt that there have been a couple nice rains in the last couple weeks, either. Lots of parking and informational signs at Peralta Trailhead. I had a good time stomping around in the early snows last year climbing up some peaks on the Hundred Peaks Section list, so with the coming of the new snows I thought about doing some more in the area. The peak guide for Eagle Rest refers to a final class 3 climb to reach the summit, which sounds like something best avoided in winter, so I let that fancy go again. A couple weeks later, I noticed the Doggetts were actually leading a hike to those peaks. Ignacia has completed the list six times and Peter has managed it thirteen times. If they think it can be done, it probably can. The only person who has done it more is a character called Mars Bonfire. (I am assured this is a real person, really called that, and otherwise famous. He has a Wikipedia page that does not even mention his twenty-five list finishes. He has moved on to other adventures now.) I sent off an email to express interest and found myself signed up. They even scouted it the day before to make sure the gate was open and the road passable. All this leads to a group of six gathering at a snowy trailhead just after 8 AM. We start off on snow compacted to a couple inches which largely finishes off as we come upon a couple old prospects. 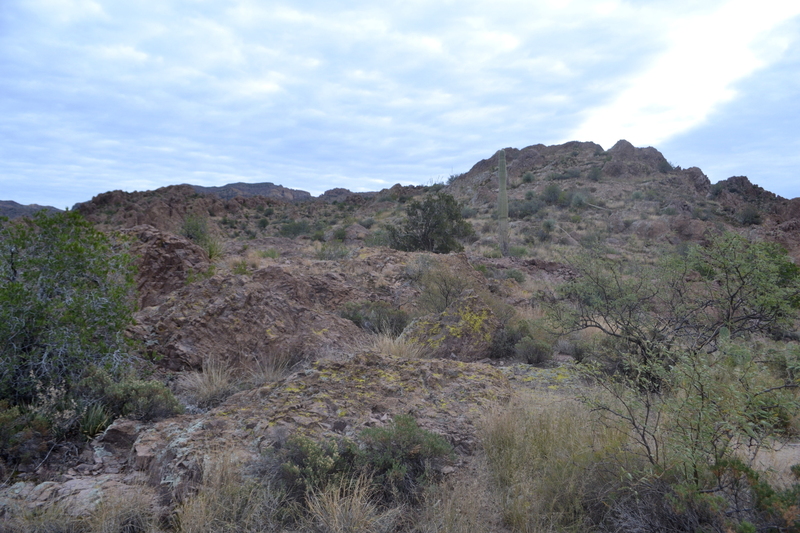 The trail we are following initially is an old mining road that is one continuation of the road we drove in on. It is covered in a couple inches of snow that fell over the weekend. We wind our way down it, breaking up the clean snow as we go. It levels off, crossing a wide saddle, and the snow largely vanishes. Beside it in the saddle are two holes surrounded by tailings supporting the notion that this is an old mining road. We drop through one avoiding a fallen tree on the road. Further on, we continue on a gentle downhill around the next peak. It looks like this area gets the afternoon sun and there is very little snow now. The downhill finishes with a few slides and a short, steep section past an old gate. Peter points out that when he was first hiking these peaks, they could drive to here. Still deep morning shadows under the pinons on this abandoned road. One last drop past an old gate to a thin saddle below Antimony Peak. My dad saw an opportunity to revisit the famous Rae Lakes loop from Roads End in Kings Canyon by taking myself and my little sister around it. Plans were for a week in the wilderness taking some time to head on down to Charlotte Lake and a day up in the Sixty Lake Basin. We got to the ranger kiosk to get a permit around the time it opened, but this was already too late to get three for Woods Creek. Instead, we got three for the less popular counter-clockwise direction up Bubbs Creek. We had day hiked up to middle Paradise Valley at one point, so this was the unfamiliar side. 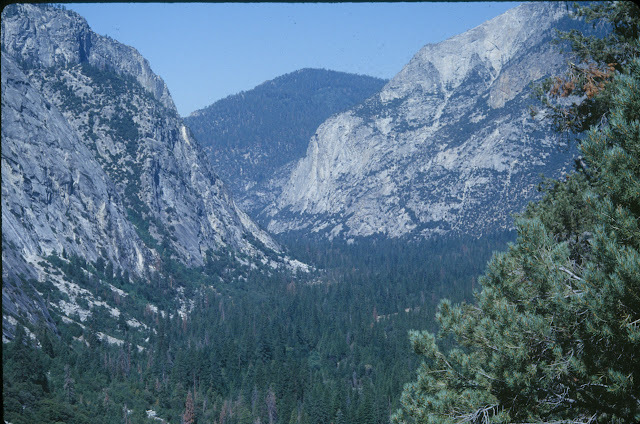 (I distinctly remember that hike, 14 miles and the longest I had done for many years, as the one I broke in my boots that was wearing and I later cut up on my second trip up Mount Whitney.) The permit being the last thing to pack, we set out on the trail. It starts off very easy on an upward grade next to the river that is so gradual it is difficult to notice. The trail is sandy. We were not in a hurry, so we rolled along through the sand using the least amount of extra energy. Sand mostly punishes those in a hurry. It was not long before we came to the river crossing and obediently followed our permit on the serious climb up Bubbs Creek. The other direction is popular because it is a gentle climb all the way to the lakes. The view while climbing up Bubbs Creek. A little bit of water.